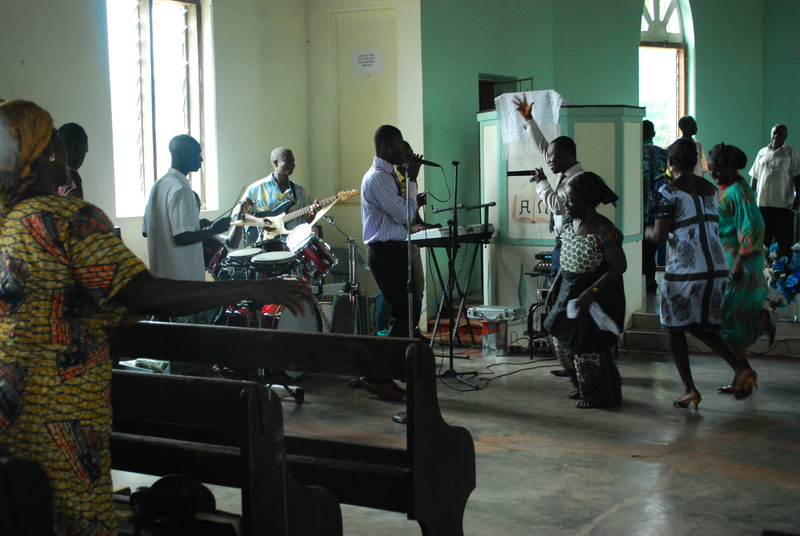 On Sunday we visited the Evangelical Presbyterian Church of Worawora. We walked into the service a little late. Derrick didn’t want us to attend the three hour service, he thought it would be too much for us. When we walked in, the pastor took time out to welcome us to the village and his parish. There was a 4 piece band — 2 guitars, drums, piano and 3 singers. Even though the speakers were a bit shaky, there was so much passion and joy radiating from everyone. The choir were clad in graduation robes (except they weren’t graduation robes of course). 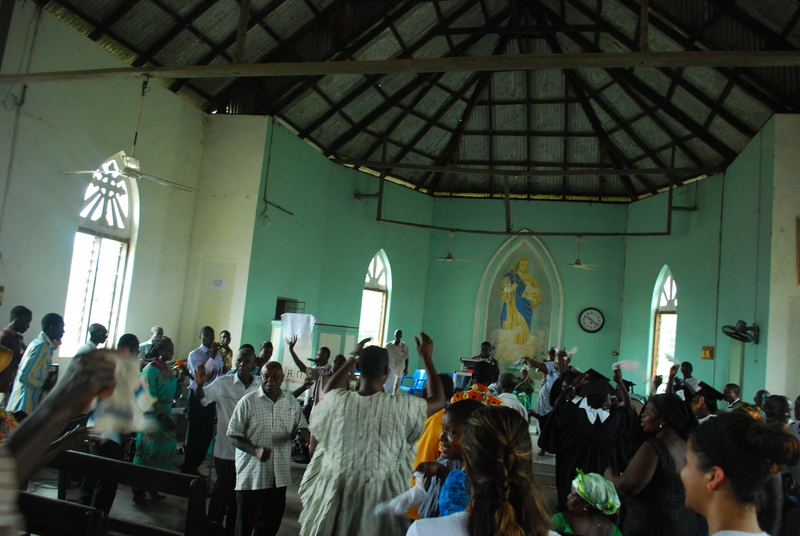 Everyone was joyously singing and dancing around the church. The beauty of the experience brought me to tears. Derrick led us all to the center of the church to join in the dancing. That moment, dancing in the circle, was one of my happiest on the project. Regardless of my own religious beliefs, I felt 100% welcomed in the church. After the singing and dancing, the extreme pastor spoke (more like yelled) for the rest of the time. He spoke in both Twi and English, so we could understand some parts of his sermon. We came back to a scrumptious lunch of coconut rice and curry chicken with a side of cucumber avocado salad. 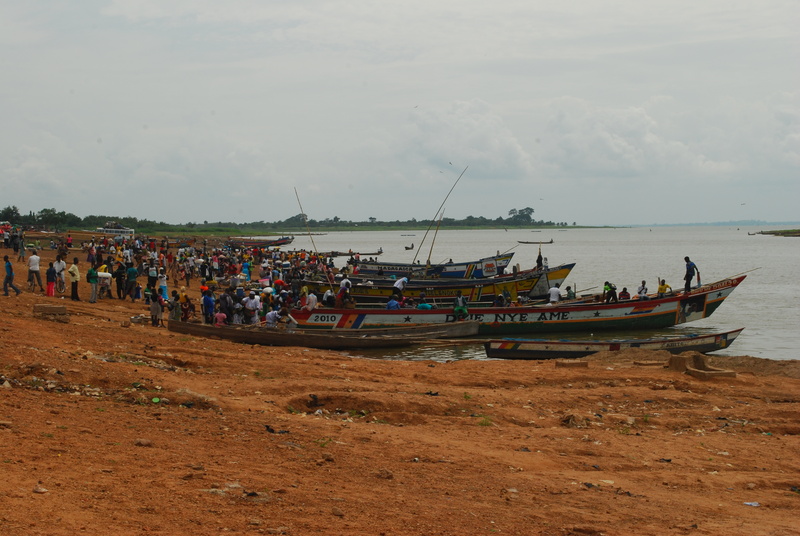 After lunch, Derrick invited us to join him as he went to another town, Aboatase, to buy red plantains. The town is about 12 km away from Worawora. As Ma Tess went food shopping, Derrick took us around the town. Once again, we were quite a spectacle. The only obrunis seen for miles. As per usual, we said hello and waved to everyone. They loved it when we spoke to them in Twi. There were dozens of long thin boats coming in and out of the harbor. 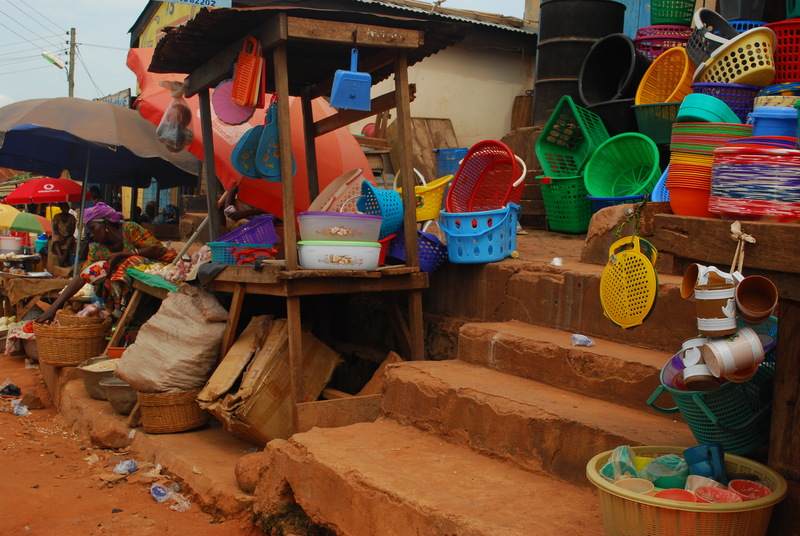 Although this is primarily a fishing town, people were selling everything — bras, clothes, kerosene, fish, fruit, etc. I was surprised at the extreme poverty of the town. One would think because it is a port it would have more wealth. I think maybe the wealth is on top of the hill? There was one nice house overlooking the harbor. The rest of the town by the water was more decrepit. Everything was incredibly visibly pleasing, but sad to see the poverty. After we left I asked everyone to describe how they felt in one word: conflicted, fascinated, content, numb and intrigued. Around 4pm we awaited the arrival of the Elders, who were coming to pay us a visit and see how we were doing. Of course they were late (they can do that because you don’t mess with the Elders). 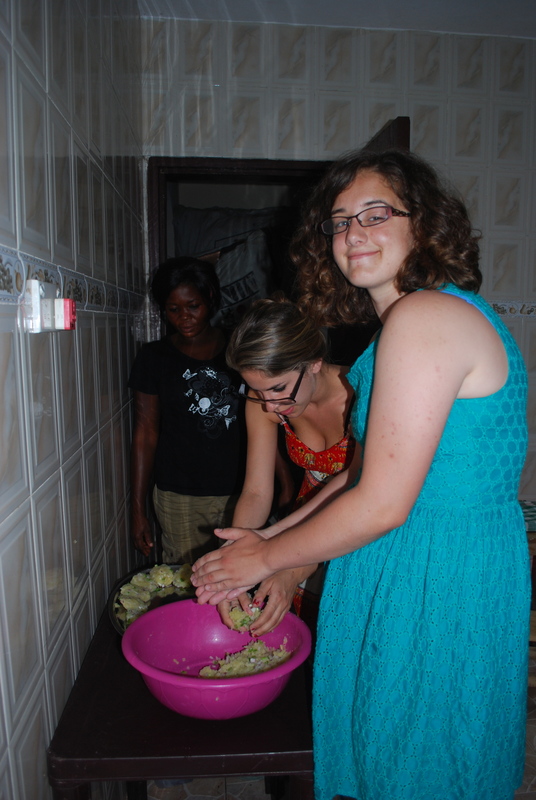 They announced their arrival by sending 4 girls to the house bearing gifts –oranges, pineapples, mangos, and bananas! When they finally arrived, we hosted them on the second floor balcony. 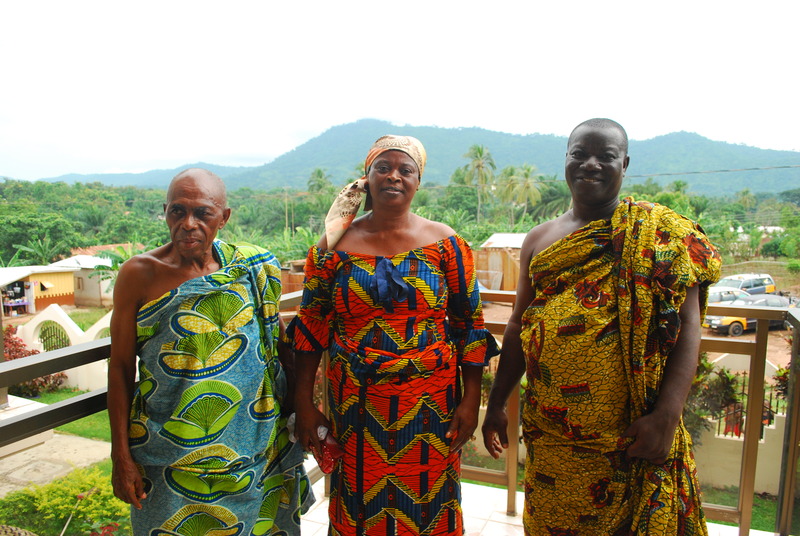 Only 3 Elders came: The Queen Mother of Worawora, the Defense Minister, and the Mayor. We went through the custom of shaking hands and “Whotesen”-ing and “Akwabaa”-ing. Leila spoke about our progress and Derrick translated everything in twi. It was a very short meeting. The Defense Minister was always smiling, he had a very welcoming face. The Queen Mother was very intimidating. I would never want to do her wrong. I could not read the Mayor very well. He never smiled and seemed very sour. After they left, Lexi, Kerry and I helped Ma Tess cook. The power went out whilst we were cooking and I had to hold a flashlight over the stove so Ma Tess could see what she was doing! It finally came back on and we helped her make the Ghanian form of latkas — potatoes with onion and veggies in patty form. Ma Tess has two restaurants in Accra called Tessalee. We later joined the rest of the team outside and played with the children. They crowd around the gates waiting for us to come out and play. I brought out bubbles and they were a huge success. At times the kids would fight over the bubbles and who got to be closest to me. They kept saying “Madam, me!” meaning “blow the bubbles in my face!” I don’t think they understood the concept of the bubbles. After dinner we went to Derrick’s family home for a musical performance with drums, dancing, and singing. All the children sat along the edges and we had seats in the center of the courtyard. The singers had microphones and the speakers were blown out so it did not sound as beautiful as it normally would. 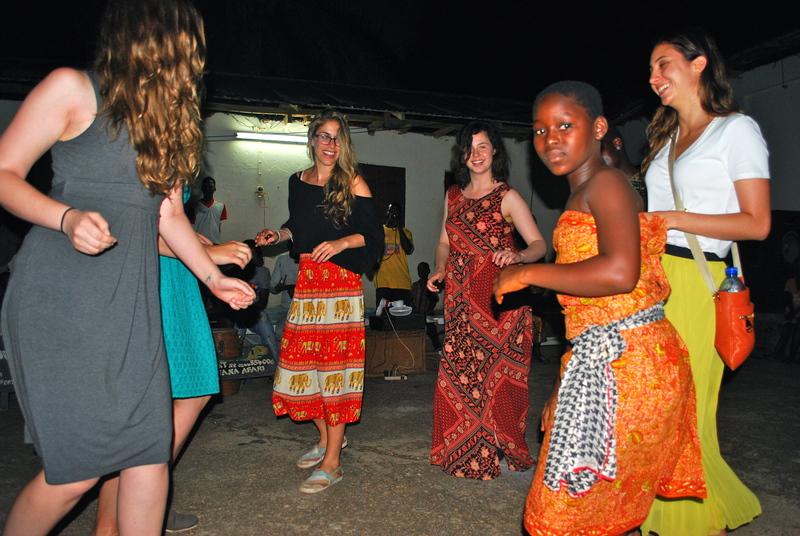 The type of dance is called adowa, a traditional dance usually performed during funerals or social events. The dancers invited us onto the floor and we tried to mimic their moves (we failed horribly).